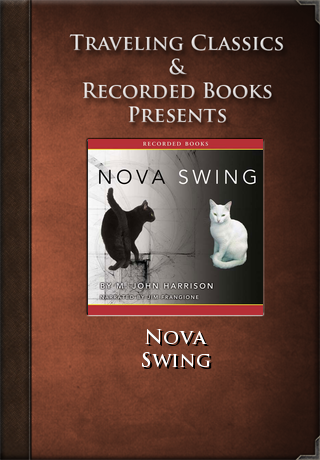 This application contains a professional recording of Nova Swing -- wrapped in a beautiful and elegant player to create an immersive and enjoyable audiobook experience. 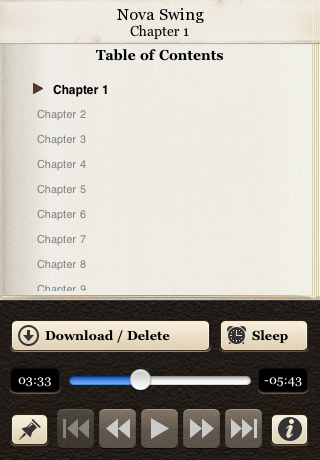 A highly acclaimed author, M. John Harrison is well known for his reality-bending tales. In this sci-fi noir, the physics-defying Saudade Event Site is a place to find strange landscapes and seemingly impossible physical phenomena- perfect for tourism. Into this environment comes Vic Serotonin, a "travel agent" whose newest client is a mysterious woman with a hidden agenda. "The miracle ... Harrison performs is to expand the possibilities of perception." -Guardian (UK)"